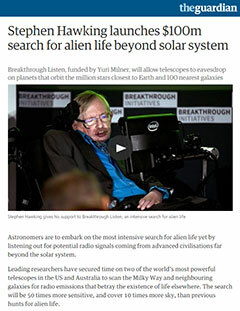 Scientists speculate on the possibility of life on other planets. Surely, they argue, given the billions of stars and planets throughout the universe, there must be some, like earth, with conditions favourable to the emergence of life. This is a statistical argument for probability based on the one known occurrence, namely that on earth. It seems to me to be erroneous to reason this way from a singularity. It should first be applied to earth itself, which has enjoyed such favourable conditions, in many habitats, for 4 billion years. Why has life not broken out in many different places and different times on earth? It is known that all living species are related one to another in a family tree of life, so that it appears, as far as we know, that all life on earth stems from one common ancestor and from one occurrence. The emergence of life on earth, the breakthrough from inanimate to animate, is truly singular and as astonishing as the emergence of the cosmos itself or of self-consciousness in humans. These three breakthroughs, each emerging from the one before, are baffling to scientists in their nature and genesis. They are the presage of the further breakthrough in history, the Paschal Mystery of Jesus Christ leading us through death to new life. Biologists, working from empirical date and scientific method, are not comfortable in trying to comprehend life, or the living being, as a whole. Did life simply emerge from chaos, by chance? Leave such questions to philosophers! Biology works well in analysis, by breaking down the living entity into successively smaller parts and smaller processes. The reductionist habit of mind is uncomfortable with the sum being greater than the parts. It readily finds the answer to "what" and even "how", but baulks at "why". Unwittingly the language of science often resorts to anthropomorphisms in describing processes. 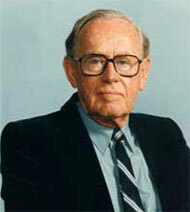 Louis Charles Birch FAA [1918-2009] was an Australian geneticist specialising in population ecology and was also well known as a theologian, writing widely on the topic of science and religion, winning the Templeton Prize in 1990. The prize recognised his work ascribing intrinsic value to all life. Click the image for more information at Wikipedia. For example, "cause and effect" is an extrapolation from the human experience of causality ("I know I am the cause because I intended it"), so that when B is constantly found to follow A, A is said to cause B. Again "natural selection" derives from the human experience of freely exercising choice. In analysing a living being into its body parts, the instinctive question at each step is "What is it for?". Supposing that something has a purpose implies a prior intention. By whom, by what? Would it not be more scientific to suppose they occur by chance, with no purpose or reason? But then why do they occur constantly? It is no wonder biologists are often accused by other scientists of excessive reductionism, as if they are trying to skirt the big question of life, or of the living being, as a whole. A great exception, in my experience, was biologist Charles Birch, who readily reached out to philosophy and theology in his grand synthesis. Some of his opinions are reproduced in what follows. Another anthropomorphism which might be introduced into the biology lexicon is "strategy". In the evolution of the species, each species can be seen to develop according to a certain line of strategy: some go after speed; some look to protectiveness; some depend on prolific reproduction; etc.. Each tends to maximise its own speciality ("natural selection"). Again in its natural activity each individual tends to maximise its inherent advantage, as for example in hunting prey predators might use speed, or stealth or ambush. Strategy in hunting is strikingly apparent when a sudden change in circumstances occasions a switch in strategy. Strategy in species development, or in a course of action, may be put down to one’s DNA which stores and passes on the necessary information. But the wonder is how a particular genome translates into action, which is akin to the wonder how the organic complexity of the human brain translates into lofty thoughts or masterpieces of art. As I understand it, DNA is not solely activated automatically or by self-generation, but in response to stimuli, i.e. inputs from the external environment (as the brain responds to sense perceptions, including those which carry information). One can see this in the growing tips of a plant, the scrambling insect, the prowling lion, the injured bird — there is a common thrust throughout the whole of nature. It is the thrust to have life and to have it to the full. So, in nature, the course of action is not purely deterministic, nor is it chaotic or haphazard. The strategy of a living being or species is in seizing its window of opportunity to pursue its aim or intent. When the human observer stands back from nature he cannot help noticing that all living things, and even life itself, have a certain inexorable thrust, what Charles Birch called "anticipation". One can see this in the growing tips of a plant, the scrambling insect, the prowling lion, the injured bird — there is a common thrust throughout the whole of nature. It is the thrust to have life and to have it to the full. This we experience in ourselves, self-conscious living beings, and we readily project it on other living beings, which are behaving in ways similar to our own. It is to admit, again with Charles Birch, a basic rudimentary subjectivity in all things "from protons to persons", or at least in all living things. This subjectivity, however limited, makes each amenable to the outreach, or appeal, of another subject. As each being is drawn to transcend itself, to reach out to become what it was not before, it is responding to the lure of another. Now turning from science to theology, we have the Christian revelation that all things were created by God. Science has shown how wonderful is that creation in its understanding of evolution, both the evolution of the universe and the evolution of life from its most primitive forms to the diversity and complexity we know now. Modern Christians can now speak confidently of God’s continuing creation. But earlier in the heated controversy between direct creation and evolution by natural selection, little notice was then paid to the formula proposed by Charles Kingsley "God made things to make themselves". Creatures, lured to transcend themselves, are co-creators with God. This raises the question of the role of the Word in creation. St John’s Gospel opens with the Hymn of the Word. "The Word" – ho Logos, was an expression much in vogue in the Hellenistic world of the time. For Jewish Christians it was allusion to the biblical Sophia, the Wisdom of God, who played a key role in the creation of the world [Prov. 8:22-31]. For Gentile Christians, familiar with the Greek philosophers, it suggested the divine principle of reason, responsible for the intelligibility and order of the universe. So this Divine Person was seen as God's blue-print of creation, a kind of template, or one might say "the divine strategy". It is the Word who appeals to whatever is subjective in creatures to break out and become what they were not before. The Word, the summation of Truth, places before each living being the truth of its kind to be unerringly pursued. 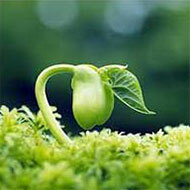 The Word offers to each a plan or model of emergence. It is a call to the thrust found in all living things, to their urge to live and live more fully. Jesus, the Incarnate Word, has said "I have come that they may have life and have it abundantly" [Jn 10:10]. It is he who imparts his own Spirit, for according to the biblical dictum "It is the Spirit who gives life" [Jn 6:63]. What is true of all living things is pre-eminently true of human beings, whose subjectivity rises to the heights of reflecting on their consciousness (self-consciousness). To the woman by the well Jesus offered "The Gift of God ... the living water (that) will become in him a spring of water welling up to eternal life" [Jn 4:10-14]. And let him drink, who believes in me. and the darkness failed to master it [Jn 1:3-5]. Here is a biblical sense of "life", which, bypassing distinctions of natural and supernatural or of a state here, or hereafter, reads more like a verb than a noun, as it expresses "becoming alive". It can be translated as "liveliness", sparkling with light that reveals the life-giving Spirit. goodness faithfulness, gentleness, self-control [Gal 5:22]. This Fruit, first blessed in the womb of Mary [Lk 1:42], is now borne on the Branches of the Vine [Jn 15:1-11], as they persist in their liveliness to glorify the Father [Jn 15:8, 16]. "The Glory of God is the human fully alive". Birch, C. 1990 On Purpose. UNSW Press, Kensington. You can contribute to the discussion in our forum HERE. In the Aboriginal gift, priest and archaeologist, Fr Eugene Stockton, explores the spiritual wisdom of the Australian Aborigines, still persisting into the present. He offers the proposal that the Aboriginal perspectives on spirituality might enrich the spirituality of other Australians. He highlights the themes of Life in Common; Reverence for Life and Land; Celebrations and Sacramentality; and Dadirri Mysticism. 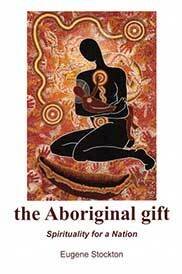 The aim is not to appropriate Aboriginal Spirituality but to let the Indigenous insights challenge the rest of us to search their counterparts in the treasury of the Christian Tradition.